MYOB Client Manager Laura Cooper put me on to this quirky poem for accountants. 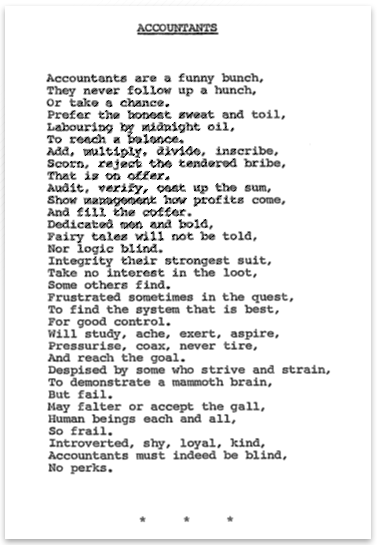 Written by her dad James Nelson in the 1970s, it reads as a manifesto for the trustworthy accountant of the era. James was an accountant with Coca Cola Amatil in the 60s and 70s. He balanced his love for balancing the books with a passion for the ploughman poet Robbie Burns of Auld Lang Syne fame. So… is the modern accountant still introverted, shy, loyal, and kind? Does she study, ache and exert? Have you found a system that is best?